Building 28 is the renovation of a 20,000 SF existing structure built in the early 1970’s. The building originally served as a warehouse with a small office area. The renovation project included replacing the building siding from metal panel to stucco, adding perimeter windows, and a new roof. 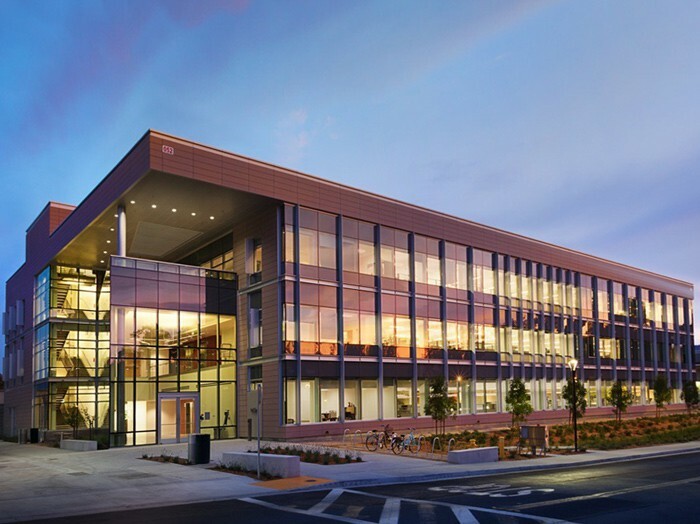 The interior was demolished and renovated into a LEED Gold office and conference room environment that has become the new home of SLAC’s Medical Department, Research Support Building, and the Radiation Protection Department. Building 52 is a new building. This 65,580 SF, 3 story structure houses the entire SLAC Accelerator Directorate which includes Operations, Engineering, Particle Physics, Astrophysics, and the 2 beam groups (Synchrotron and Linac). Its exterior skin is clad in terra-cotta and glazed aluminum curtain wall, with metal panel soffits protecting some of the entryways and an elevated terrace. The building interior features an open atrium with skylights; stone stair treads, polished concrete floors, and glass and stainless steel handrails; and includes open and hard-walled office areas, conference spaces and break areas. An option was taken to build a data center type core and shell with infrastructure provisions for the future build out of the new campus Main Control Center, where the particle beams will someday be controlled remotely. The MEP systems were complex, and used a combination of VAVs with and without reheat, active chilled beams, and a heat-pump chiller for improved energy efficiency. This project was designed and constructed in a design/build delivery method meeting LEED Gold for new construction. Building 41 is the renovation of a 40,070 SF existing concrete building. The building was originally constructed in the late 1960’s and has had few upgrades since then. The renovation project will include the complete soft demolition of the building interiors and the addition of new MEP systems and interior finishes. New landscaping and hardscape will be installed at the building main entries and at the courtyard. The interior renovation will include a new elevator, main stair, open and hard-walled office areas, conference spaces, break areas, and restrooms. This project will be attempting LEED Gold certification for renovated buildings, and upon completion, the renovated building will accommodate SLAC’s Environmental, Safety and Health Department, Human Resources, the Financial Office, and the Department of Energy. The program is phased in this order; Building 28 completed in November 2011, followed by Building 52 completed in July 2013, and then Building 41 which has an anticipated construction schedule of one year from award, and was completed in October 2014.